Rent a Car - Vermont is a relatively small state and Uber is not available in a lot of the small towns. We flew in to Albany, NY, rented a car and drove to Manchester - it was only about an hour and a half away and was such a gorgeous drive! There are several other airports within driving distance of different parts of the state. 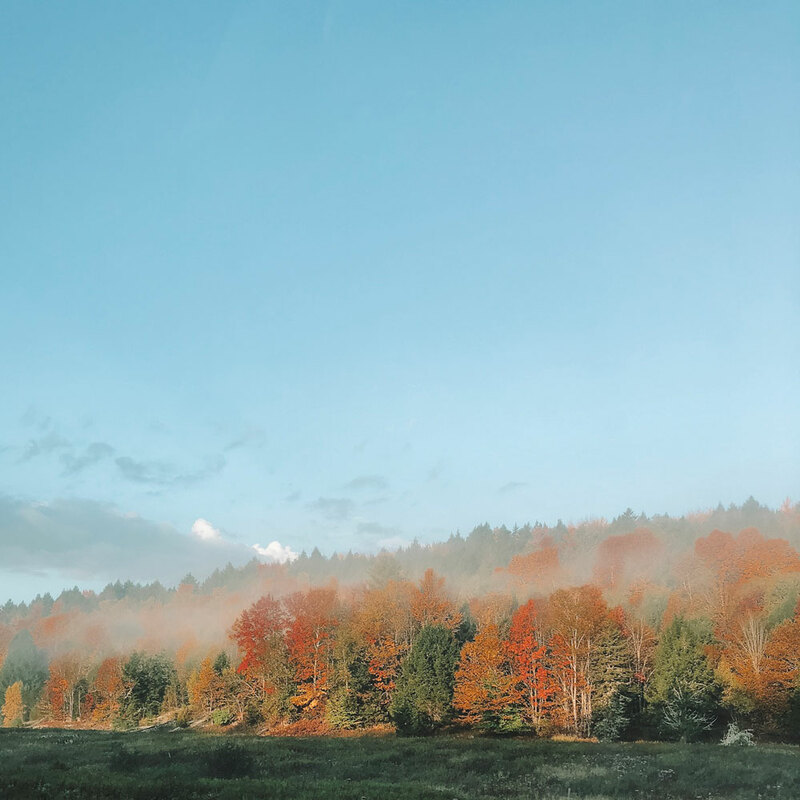 You will definitely want a car to drive up the Green Mountains to get those leaf peeping views! Track The Foliage - We picked our fall foliage trip dates based off of this leaf tracker. It was pretty accurate, too! However, when we arrived, we quickly learned that Columbus Day was the busiest weekend of the whole season in Vermont. 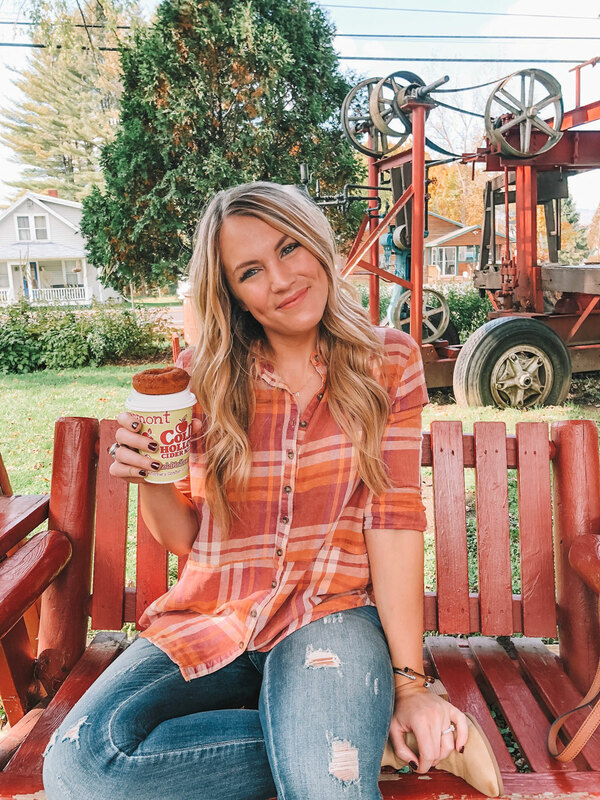 Holy leaf peepers! Pack Layers - In the mornings and evenings it was crisp and chilly but during the day the temps soared into the 60s and 70s....we were sweating on our last day! Definitely be sure to pack layers that you can take on or off according to the weather. I wish I would have had a few short sleeved shirts with me. 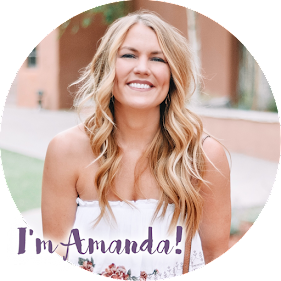 Make Dinner Reservations - If you're visiting during the fall, chances are a lot of others will be, too, and they take it very seriously. 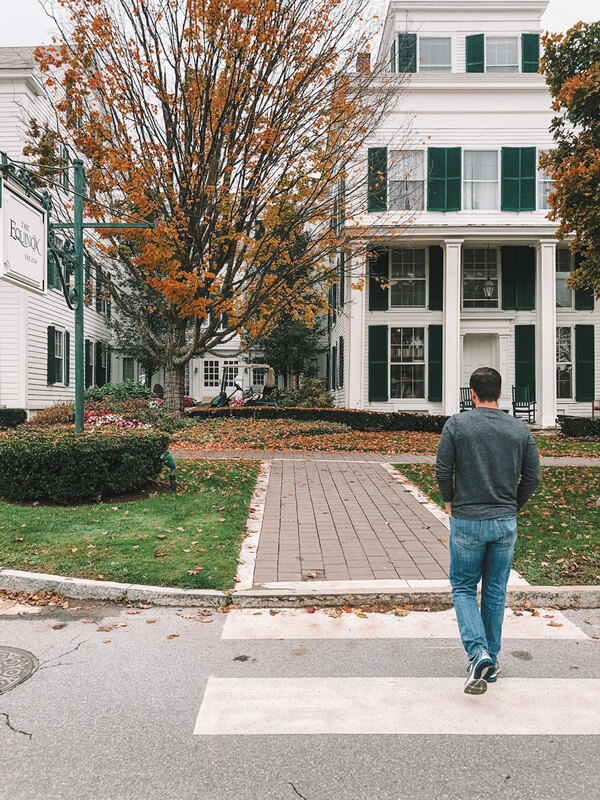 Turns out, a lot of people make leaf peeping a yearly tradition and literally make their hotel and restaurant reservations a year in advance (!!!). If you want to ensure a good dinner without an hours long wait, make reservations as soon as you can. As I mentioned above, reservations are KEY during leaf peeping season. People borderline laughed at us when we asked how long the wait was. Some of the restaurants we ate at were probably not the absolute best in town, but that's OK! 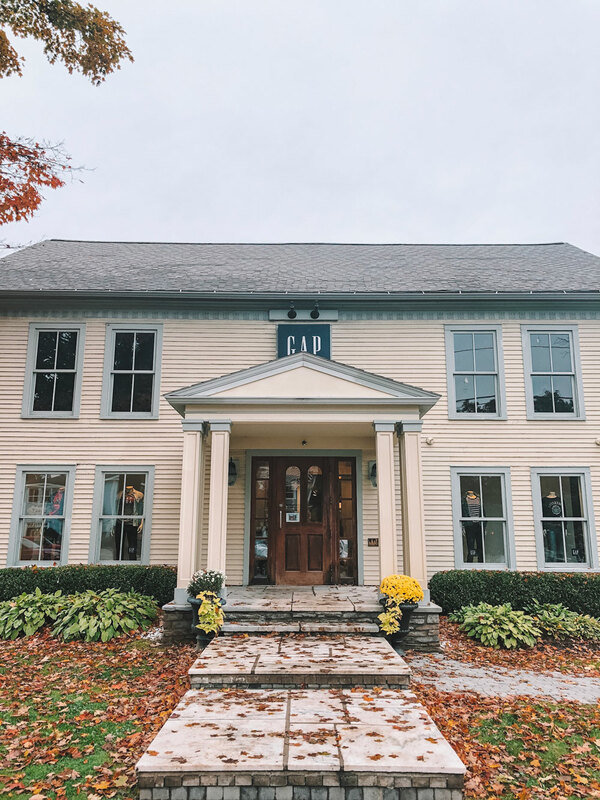 We noticed that a LOT of the restaurants in both Manchester and Stowe had a upscale pub vibe with some British inspired dishes. If you're into fancy pub food and craft beer, you'll be happy! 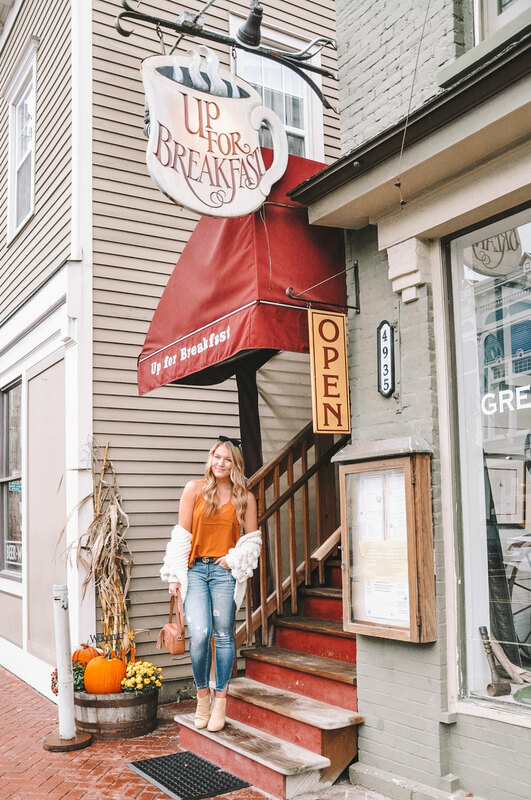 Up for Breakfast - where you literally have to go UP because it's on the second floor of a building in the downtown area! It is definitely THE place to go for breakfast in Manchester! Get there early to avoid a long wait. They have a huge menu of breakfast goodies, they served Pumpkin flavored coffee and of course, REAL maple syrup! 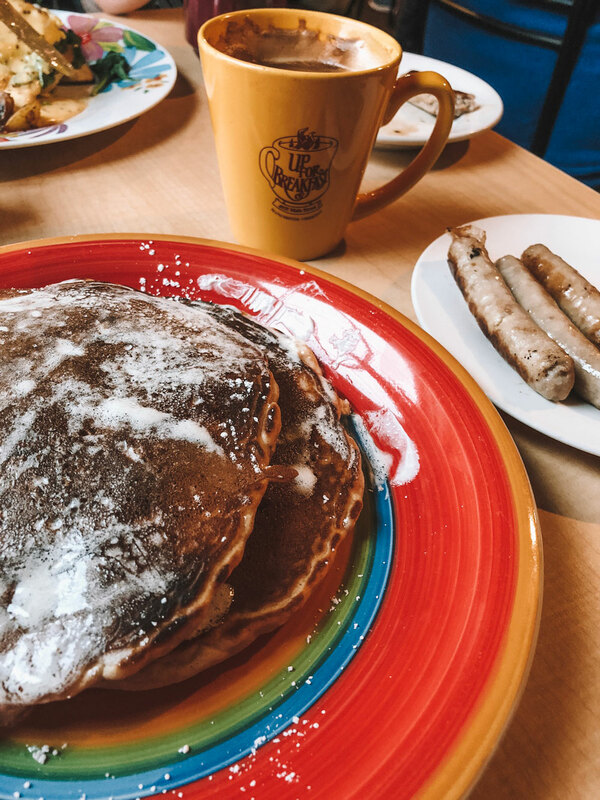 I got the Morning Glory Pancakes and they were sooooo good. Marsh Tavern - we had lunch at Marsh Tavern and really enjoyed it! We wanted to sit on their patio (SO CUTE) but they weren't serving on the patio when we were there. 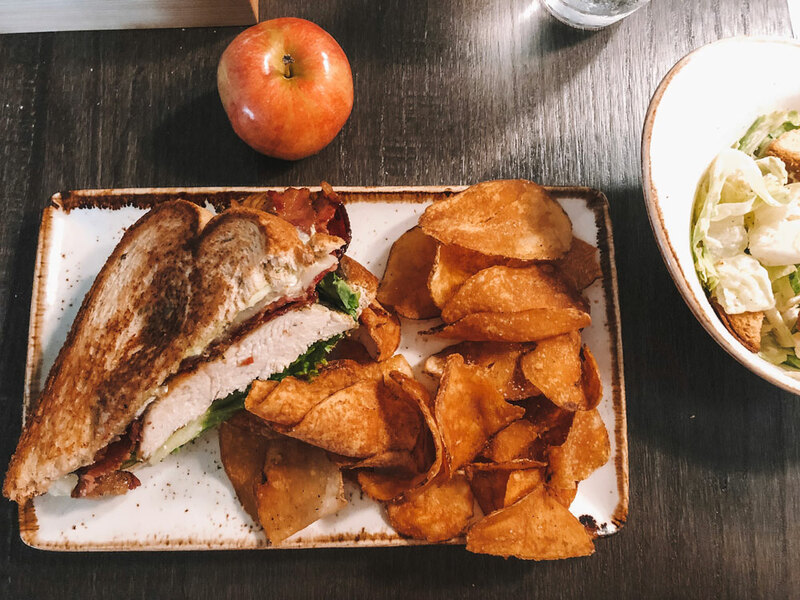 Word on the street is that their tomato soup and grilled cheese lunch special is to die for but I ordered the chicken sandwich with a side caesar salad and it did not disappoint. It was one of the better caesar salads I've had in a while! They also served the yummiest bread basket complete with an apple and tasty toppings! The Copper Grouse - we didn't actually get to eat at The Copper Grouse (it was the restaurant located in our hotel) but we heard great things so I wanted to mention it! It was SO BUSY that we gave up waiting and ate at the bar across the street. In hind site, I really wish we would have just ordered room service! Their menu looked delicious. 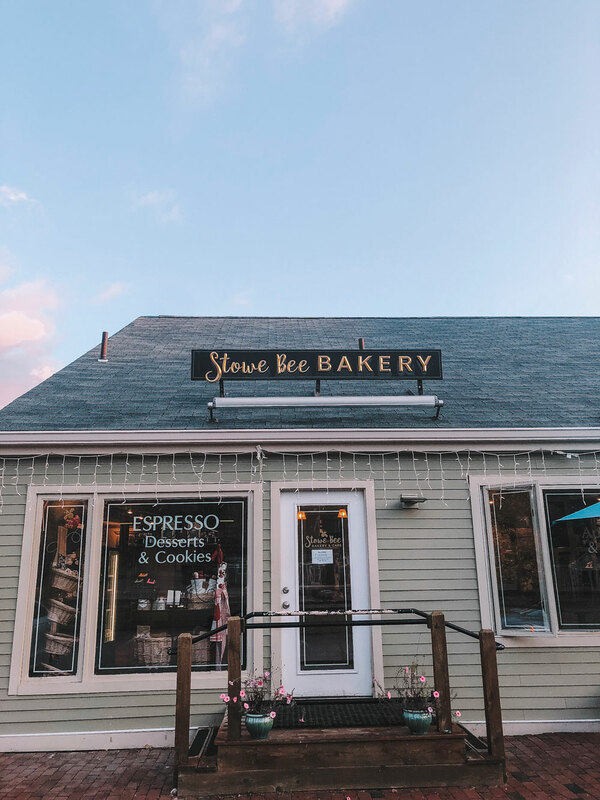 Stowe Bee - we ate here on our last day and were pleasantly surprised at how yummy it was! They have grab and go breakfast sandwiches as well as quiches, popovers and a whole case of baked goodness. The scones were some of the best I've ever had and their coffee was great! Piecasso - a yummy little pizza place! Neither C nor I actually ordered pizza, but it sure looked and smelled good! I had the black bean and sweet potato burger....for some reason I was really craving one and it fulfilled the craving. The Bench - C's favorite meal of the trip! We split the Cuban Pizza (one of the more unique pizzas I've ever had) and the Kale Caesar Salad. It was really yummy! 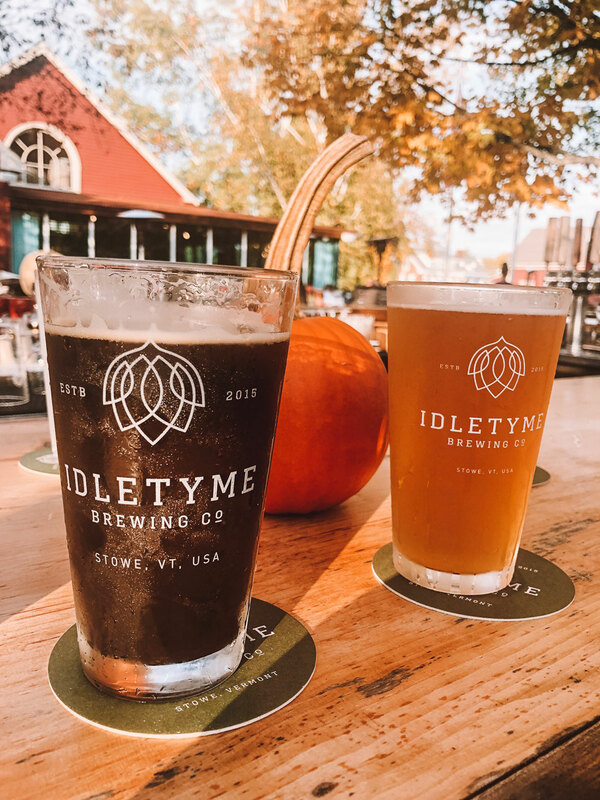 Idletyme Brewing - we only had happy hour beers here (their outdoor bar area is pretty legit) but their menu looked great and they were bustling! Apple Core Luncheonette - a part of Cold Hollow Cider Mill and my favorite meal of the trip! I got the "Vermont to the Core" sandwich which was kind of like a grilled cheese but with apples and bacon on it, too! YUM. 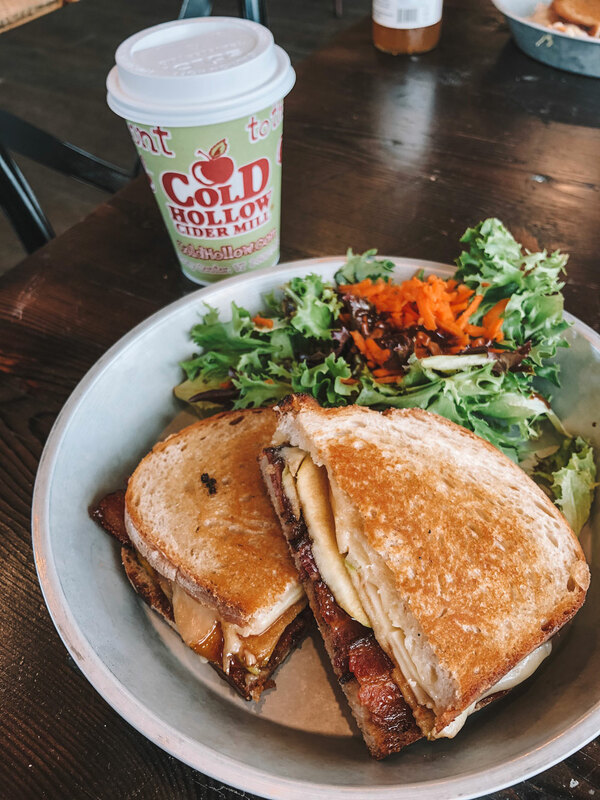 If you're planning on visiting Cold Hollow, definitely plan to eat lunch while you're there! Morse Farm - actually located in Montpelier (about 20 minutes from Stowe) but 100% worth the trip! They serve THE best Maple Creemees! 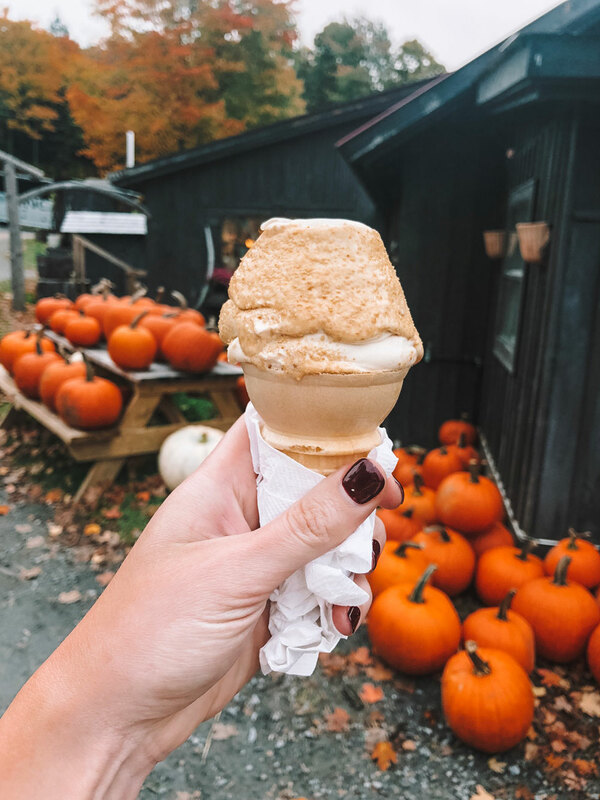 Think: maple flavored soft serve ice cream dusted with a maple sugar coating. OMG my taste buds will never be the same! 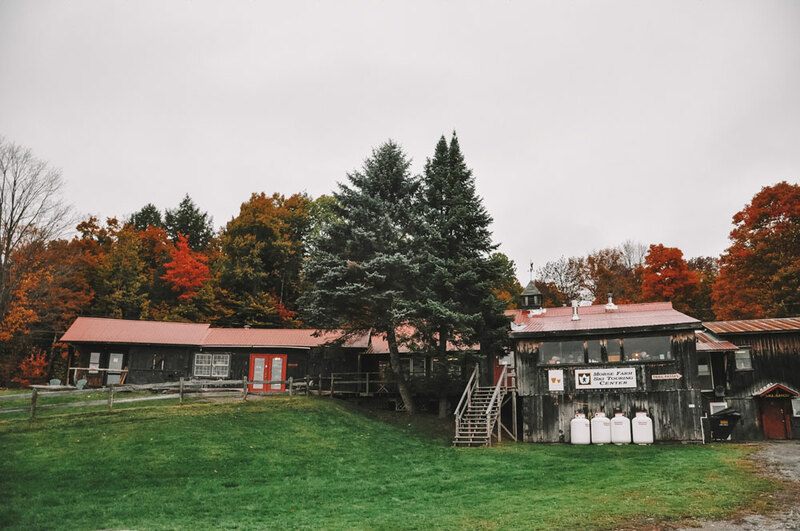 They also have a shop filled with maple syrup goodies and souvenirs and an amazing foliage backdrop. Manchester - Manchester is a very walkable town with lots of shops to pop in and out of! 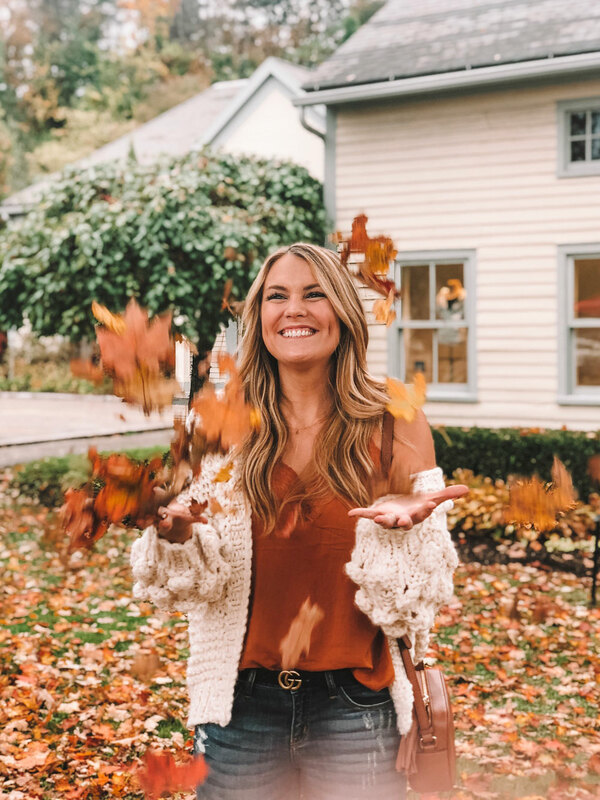 There are boutiques and local stores and big brand names alike (like Northshire bookstore, Ugg, Apricot Lane and Orvis) but the Manchester Designer Outlets are the most popular attraction. There is a Gap, Kate Spade, Crabtree & Evelyn, Michael Kors, Vinyard Vines and more. I wish I would have had more time in Manchester to shop the day away! 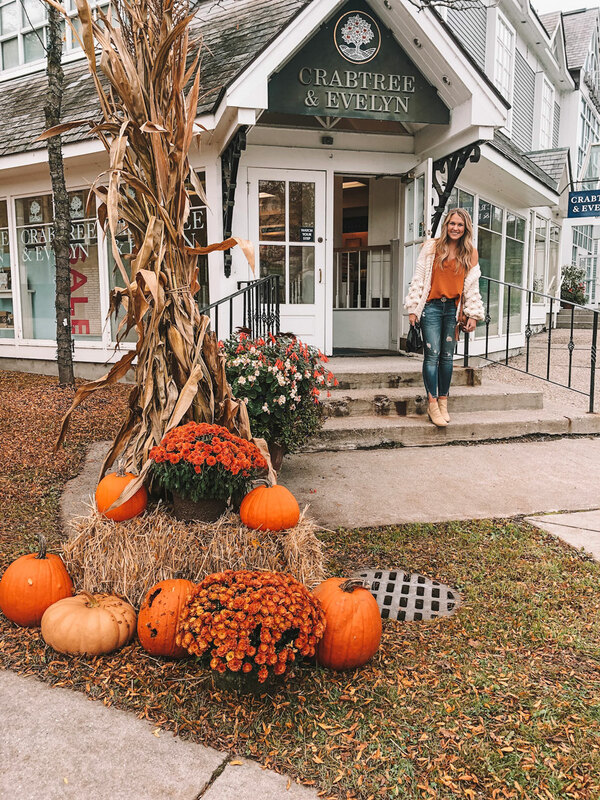 Downtown Stowe - there's not a lot of shopping in Stowe but there are a few fun stores! Stowe Mercantile had a ton of yummy food and old fashioned candy and the boutique above had some really cute sweaters, tops and scarves at great prices. 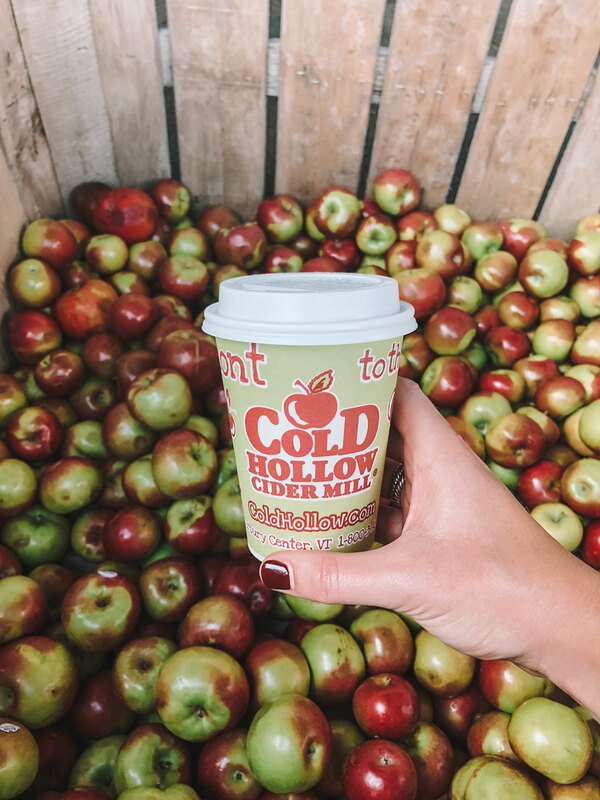 Cold Hollow Cider Mill - this was HIGH on my list of places to visit! It almost seems like it has become a blogger's right of passage haha. It's located in Waterbury which is about halfway between Stowe and Montpelier...an easy drive from either location. They have apple cider donuts, hot and cold apple cider and OH MY it was delicious. Their gift shop is also maaaassive! 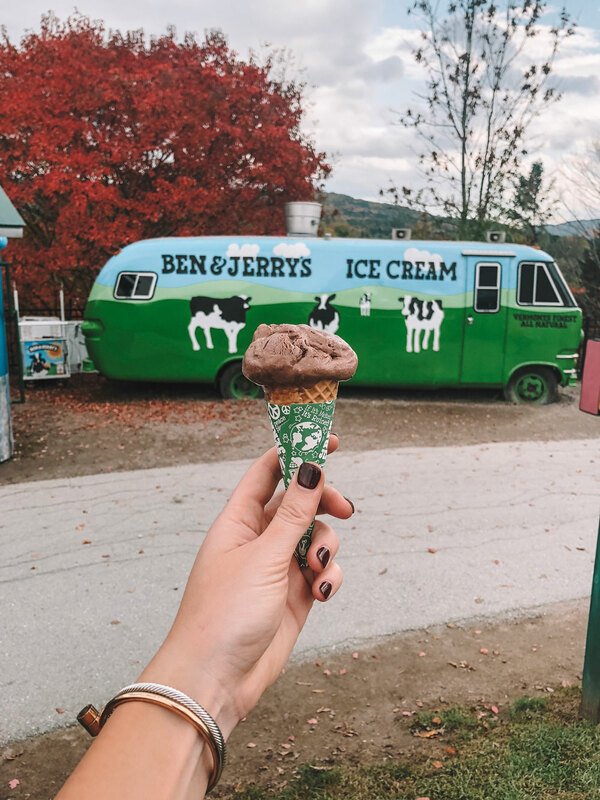 Ben & Jerry's - the B&J's factory is located in Waterbury and they offer factory tours! It was pretty busy when we were there so we didn't take the tour but we did indulge in some ice cream. The even have a legit graveyard for all the discontinued flavors. 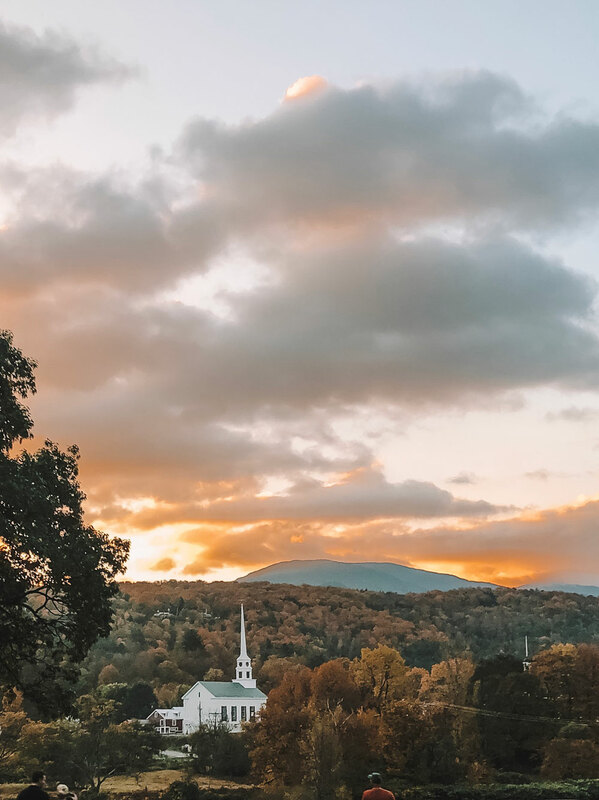 Morse Farm - as I mentioned above, Morse Farm is located in Montpelier but it is 100% worth the short trip. My mom has been telling me about this place for YEARS and it lived up to the hype. 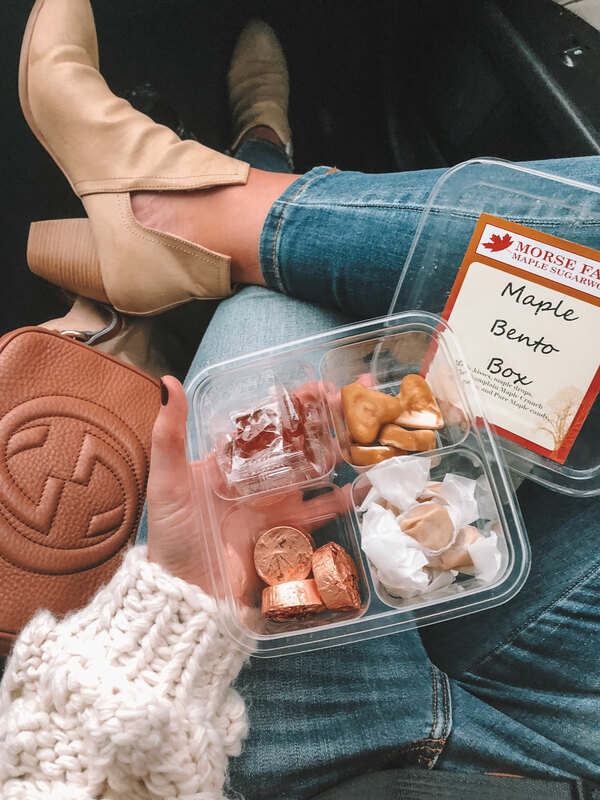 They have the best maple syrup ever, tons of maple syrup goodies (candy, chocolates, gifts, souvenirs) and maple creemees (YUM). They even ship straight from their store so you can load up on syrup and not weigh down your suitcase. Smuggler's Notch - the prettiest drive up the mountain in Stowe. 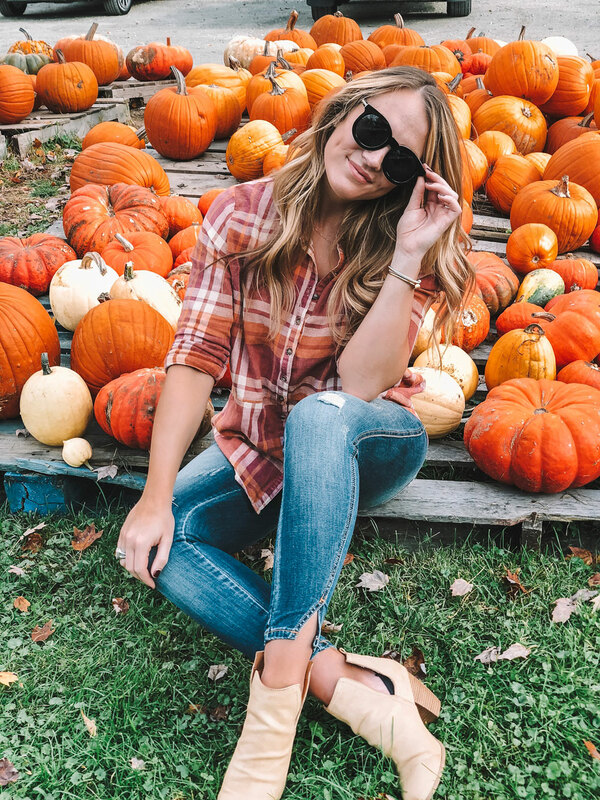 It was definitely the best fall backdrop we saw and literally everyone that drove by pulled over to take a picture (not just me!). They have camping and hiking there, as well. Kimpton Taconic in Manchester - this was one of the best hotels I've ever stayed in! You can read my full review here. Spoiler, it gets all the stars. I could sip coffee on their front porch for hours on end. 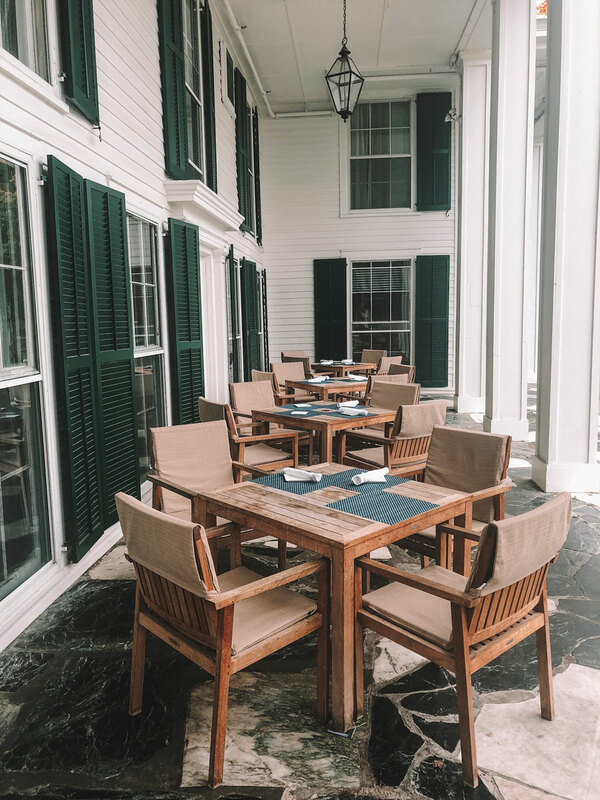 Green Mountain Inn in Stowe - this inn was built in the 1800s! 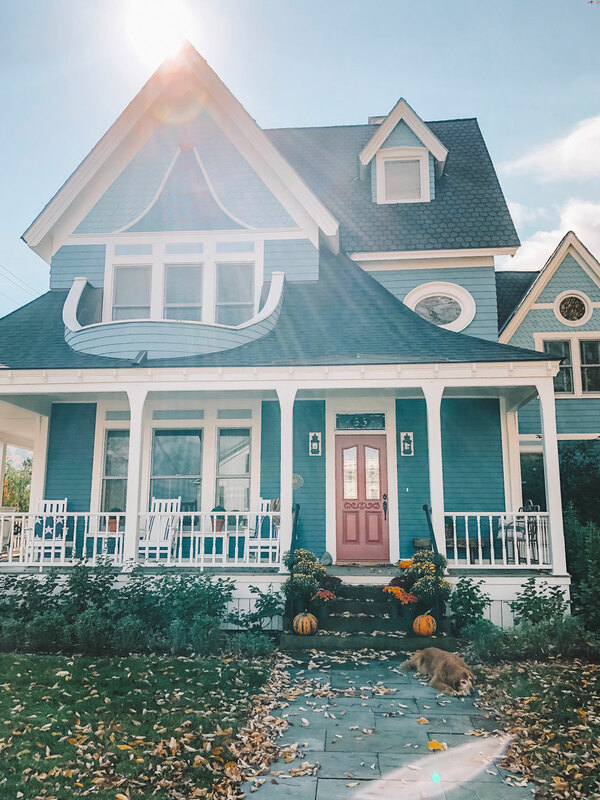 You know I'm a sucker for historical homes (my own home is 100 years old) so I loved the quirky charm! 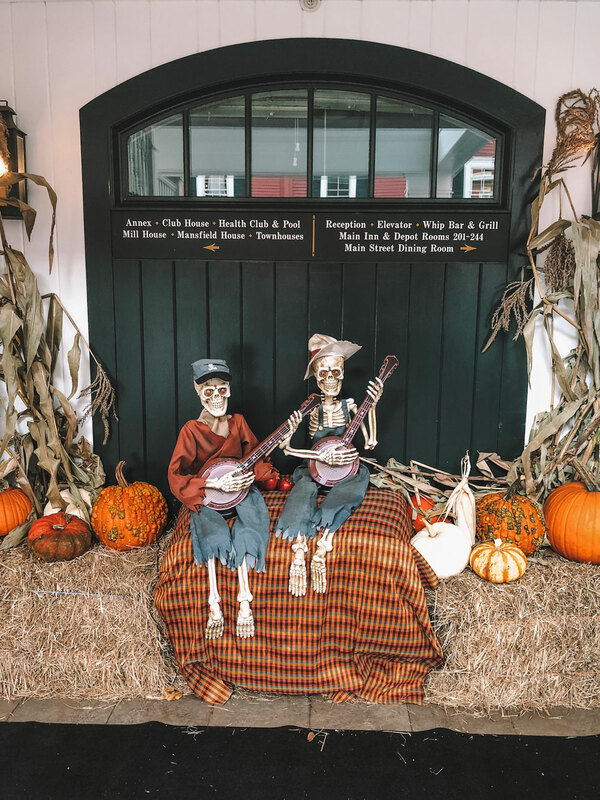 They decorated for Halloween and had the cutest fall front porch. They have a variety of room types but we got a standard queen room. It was pretty small, but charming. The walls were thin and the old floors were creaky so I would recommend bringing ear plugs to sleep, just incase. I didn't ever need them, but I was glad I had them on my nightstand. 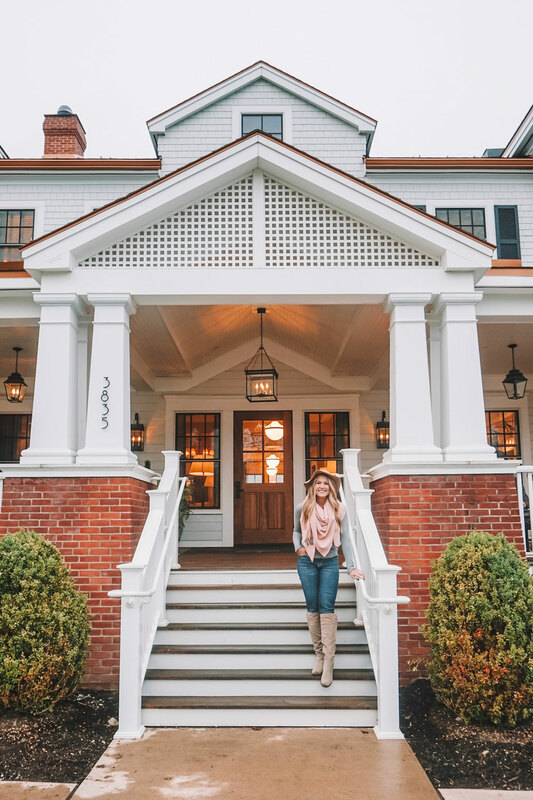 The inn is located right in the heart of downtown Stowe. It is a ski town, so a lot of the other hotels are further up the mountain. It was nice to be right in the middle of everything! I would definitely stay here again. There ya have it! I wasn't there for long, but it was long enough to fall in love with the whole state. It was a really great trip with so many pretty sights. As I mentioned, my mom grew up in Vermont so it was cool to see my family's history. I tracked down a stone house that my granddad built by hand during the 1930s in the Great Depression with stones he carried up from a creek. It was so cool to see it in person after hearing the story my entire life. 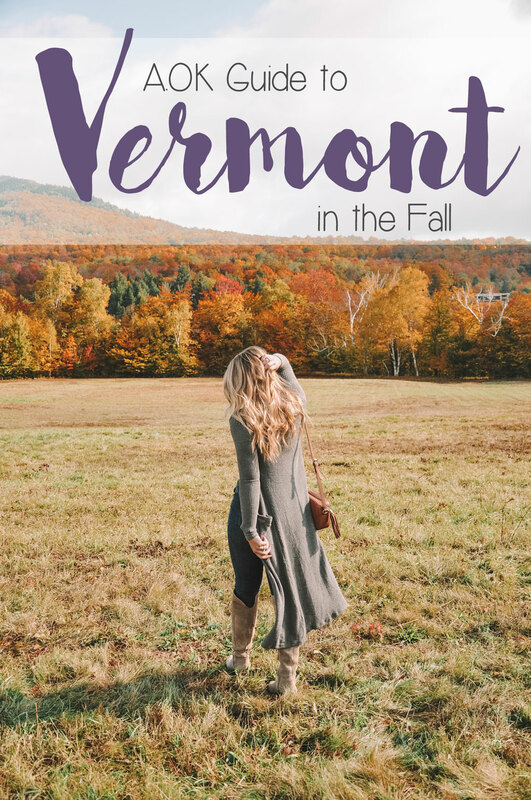 Have you ever been to Vermont or other parts of New England during the fall? 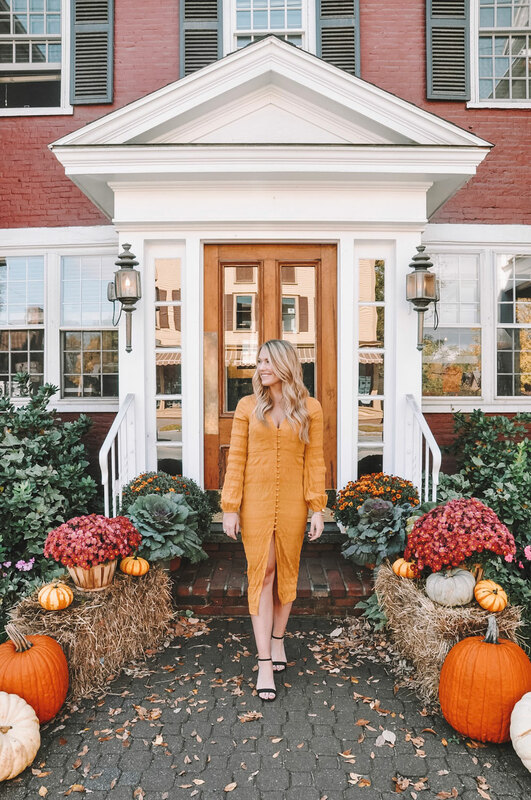 It is seriously so dreamy and the perfect fall destination! I would love to go back year after year. 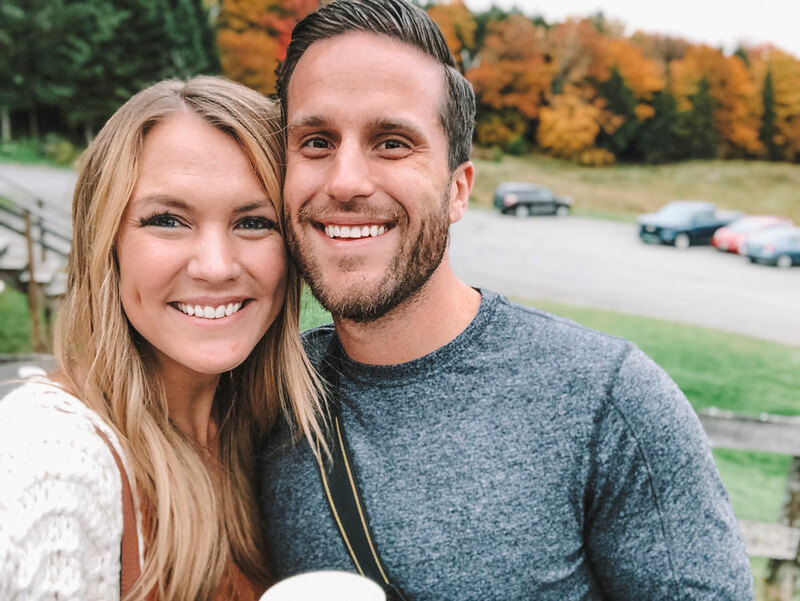 I also want to go back during the holidays - I can only imagine how magical it is at Christmas (insert White Christmas quote, "Vermont must be beautiful this time of year....all that snow..."). 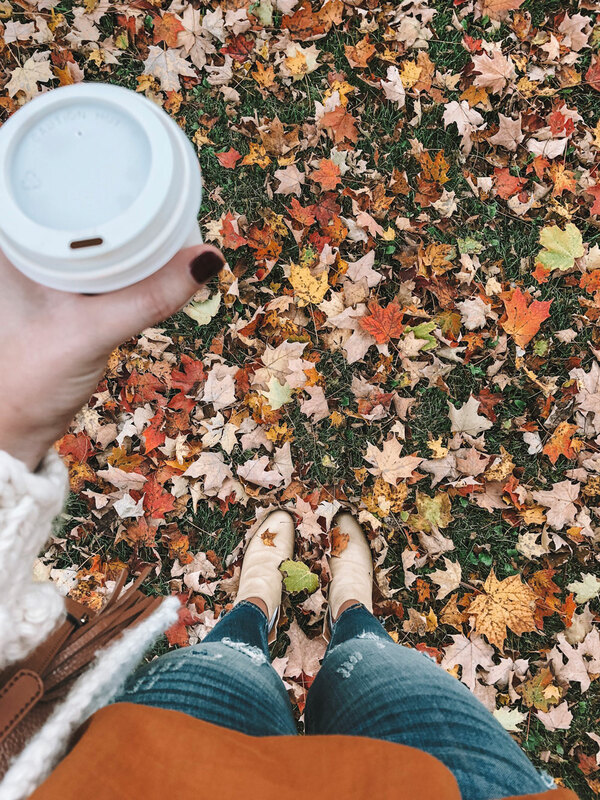 Where is your favorite fall destination? Let me know in the comments. Thanks for reading and happy travels!